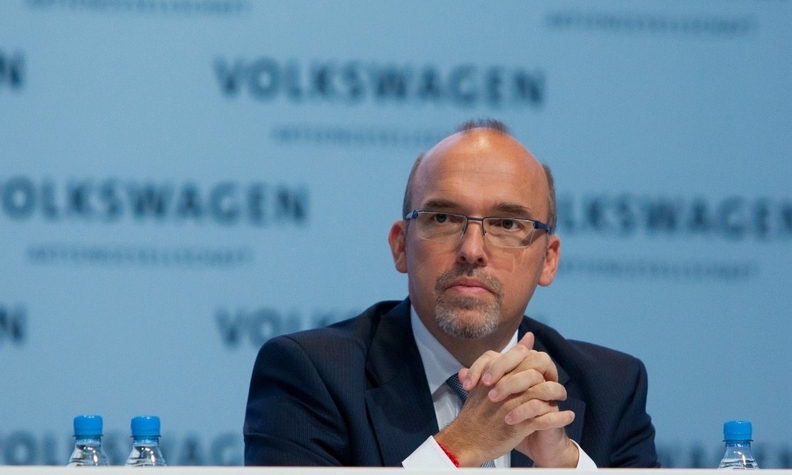 Klingler, pictured, has close ties to ousted VW Group Chairman Ferdinand Piech. BERLIN (Reuters) -- Volkswagen Group sales chief Christian Klingler, an aide of ousted Chairman Ferdinand Piech, could lose his job as part of a reorganization by the carmaker intended to boost profits, company sources said. Klingler's position could be axed as top players at VW draw up a new company structure to boost regional sales operations and make the group more nimble, two sources told Reuters. VW is aiming to increase cost savings at its VW brand to 5 billion euros ($5.6 billion) by 2017. The company is tackling trouble spots exposed by the showdown in April between Piech and CEO Martin Winterkorn, which triggered the departure of Piech, VW's long-time patriarch. The push to make Klingler's job redundant by giving more clout to brands and regional leaders coincides with deep-seated criticism by some managers of Klingler, who has overseen VW group sales operations since January 2010, one source said. Klingler himself has pushed out various managers in his department and failed to address product gaps in the United States and Brazil where VW brand sales are falling, the source said on condition of anonymity. Family ties have so far helped protect the sales chief. Klingler is chairman of Porsche Holding Salzburg, Europe's largest automotive retail company co-founded by Piech's deceased mother Louise. An Austrian like Piech, he is also married to one of Piech's relatives. "Klingler certainly has some opponents," the source said. "So far, the rule has been that whoever criticizes him also indirectly rounds on Piech. That safeguard mechanism has ceased to exist." Forthcoming changes at VW could spark a wider reshuffle of managers, the source added. A spokesman at VW declined to comment. Klingler, attending a business seminar in Paris, could not be reached for comment. While VW Group sales, under Klingler's watch, surged 62 percent to 10.2 million cars last year from 6.3 million in 2009, profits have barely grown, reflecting ruthless discounting to protect market share. VW's powerful labor representatives, who have sought to exert more influence over strategy since Piech was ousted in April, openly blame Klingler for underperformance abroad. "The problems in the United States are clearly a product- and sales-related issue," Bernd Osterloh, who is head of VW's works council, told Reuters last week. A month ago, Winterkorn told a management conference that "it's time to further develop our leadership model and to reorganize the structures and tasks a bit." Klingler's likely exit from VW's nine-member management board is looming as the carmaker searches for a new chairman, with labor representatives and No. 2 stakeholder Lower Saxony holding enough votes to potentially veto any candidate. The power vacuum at the top is will not help former BMW development chief Herbert Diess when he takes over stewardship of the mass-market VW brand on July 1, one of the sources said. Diess, who at BMW was responsible for cutting spending on components and supplies by at least 4 billion euros, will be closely watched by labor when he assumes responsibility from Winterkorn for seeing through cost-cutting measures. VW has long faced calls to cut fixed costs in Germany and improve production efficiency at its factory in Wolfsburg, where 50,000 of its nearly 600,000 employees around the world work, but labor representatives and Lower Saxony have so far withstood such attempts. "No one hires someone like Diess when it's known how he works," the source said, adding that Diess was imposed on Winterkorn by Piech. "There won't be a lot of joy in Wolfsburg when he starts. Things are bound to get difficult."